Sony has a complicated history with Spider-Man. After falling at the final hurdle in Sam Raimi’s trilogy with Spider-Man 3 and then crashing their own Spider-Man cinematic universe before it had even begun in The Amazing Spider-Man 2, they reluctantly lent the character back to Marvel Studios. It would be easy to accuse Sony of mishandling this beloved hero over the years, almost as though they didn’t know what to do with the character. That is certainly not the case with Into the Spider-Verse. This film is clearly a labour of love for Spider-Man and strikes the perfect balance between appreciating the old and exploring the new. 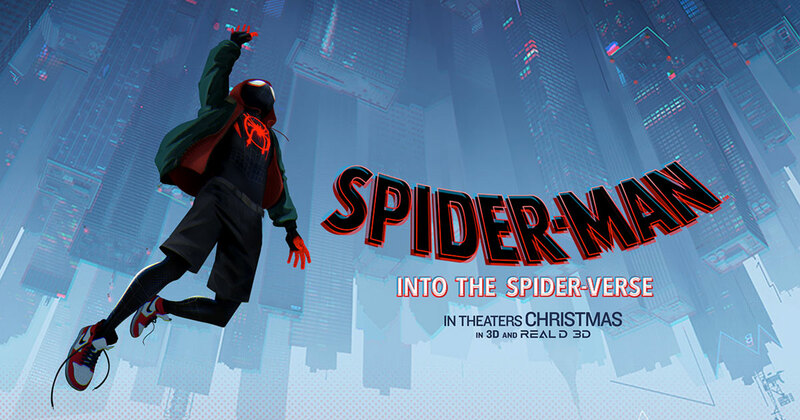 When young Miles Morales (Shameik Moore) finds out he has gained spider-powers, he seeks the advice of Peter Parker (Chris Pine) to show him the webs. Yet when Kingpin (Liev Schreiber) opens a portal to several other dimensions, Miles must ditch his training to help send his new friends home. It’s a phrase thrown around a lot when discussing superhero movies, but this film genuinely looks like it has jumped out of the pages of a comic book. Scratch that, this film is a moving comic book, bringing those pages to life in a way that I have never seen before. The style of the animation is totally original. A 3D world given a 2D aesthetic, made up of explosions of primary colours and zippy movements straight out of the cartoon. It works so well you’ll question why it’s never been attempted until now. The frenetic world created within the animation is the perfect playground to explore the movie’s narrative. We get to experience parts of the Spider-Man universe never seen before on the big screen. Shameik Moore brings Miles Morales to life brilliantly. He’s seriously charming, whilst still having that dorkiness that embodies Spider-Man. 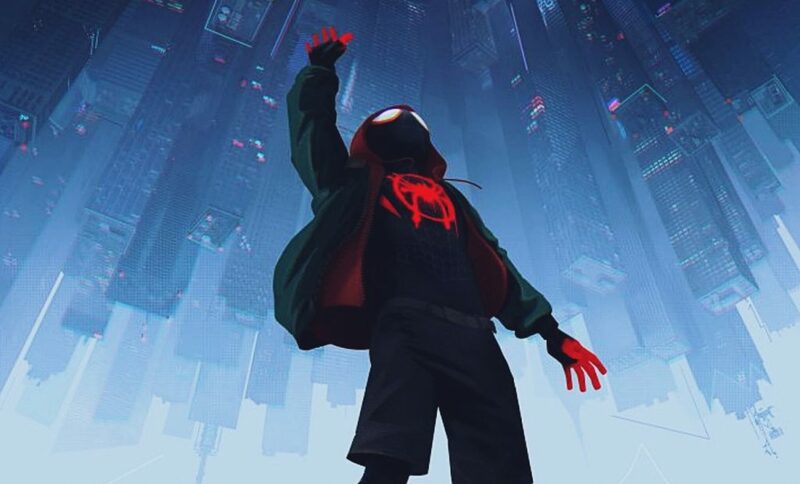 The movie’s sheer craziness could have easily stolen the limelight from him, but this is very much Miles’ story and it’s all the better for it. The rest of the Spider-gang all shine too. Spider-Man Noir is played superbly by Nic Cage and the casting of John Mullany as Peter Porker is simply perfect. Whilst the film never stops covering new ground, it is constantly loyal to everything you love about your favourite web-slinger. There are some new and innovative interpretations of most of Spidey’s rogues’ gallery. The suits are all present and just as you remember them. There are plenty of references to creators and characters alike (including a beautiful Stan Lee and Steve Ditko tribute). It all feels like classic Spider-Man. And whilst the film is constantly pushing the boundaries in new directions, you feel like you’re in safe hands. As you might expect from a screenplay produced by Lord and Miller (The Lego Movie, 21 Jump Street), this film is also a romp. Considering the wealth of characters and animative techniques on display, it’s so tightly paced that the nearly 2-hour runtime simply ‘thwips’ by. It’s too soon to tell right now, but I have a hunch that this will be remembered as the definitive cinematic depiction of Spider-Man. After three iterations in under a decade, Into the Spiderverse achieves the unthinkable of reinvigourating the character for both new and old audiences. Every aspect of the film; the plethora of wacky characters on show, the stunning animation and the ‘wink and nod’ humour are entirely fresh and original. I can guarantee that you’ve never seen anything like this before and when you come out of it, you’ll be mighty glad you have.